President Obama says the history of the Jewish people - centuries of oppression climaxing in the founding of the state of Israel - resonates with African Americans and inspires them. 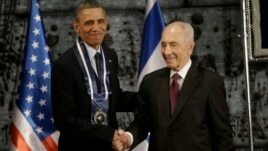 Speaking at a state dinner in Jerusalem with Israeli President Shimon Peres, Obama said the story of the Jews - as he put it, "from slavery to salvation, of overcoming even the most overwhelming odds" - is relevant throughout the world. In the United States, Jewish Americans and African Americans can come together in freedom and security because of struggle and sacrifice by generations of their forbears, the president said during a speech Thursday night. Obama recalled Biblical accounts of the slavery Jews endured many centuries ago, and the enslavement that men, women and children of African origin faced in the United States in modern times, until the practice was outlawed in 1865. He also remembered the Jewish Americans who marched together with African Americans during the civil rights struggle that led eventually to laws guaranteeing equality for all Americans.